A supplemental guide to diseases for D&D that’s nothing to sneeze at. A review copy of “The Malady Codex” was provided by the publisher. Find more DMs Guild Reviews on my website and YouTube channel. Disease and pestilence are as much a part of D&D as anything else, yet few would dare create an entire supplemental guide exploring new and virulent maladies. 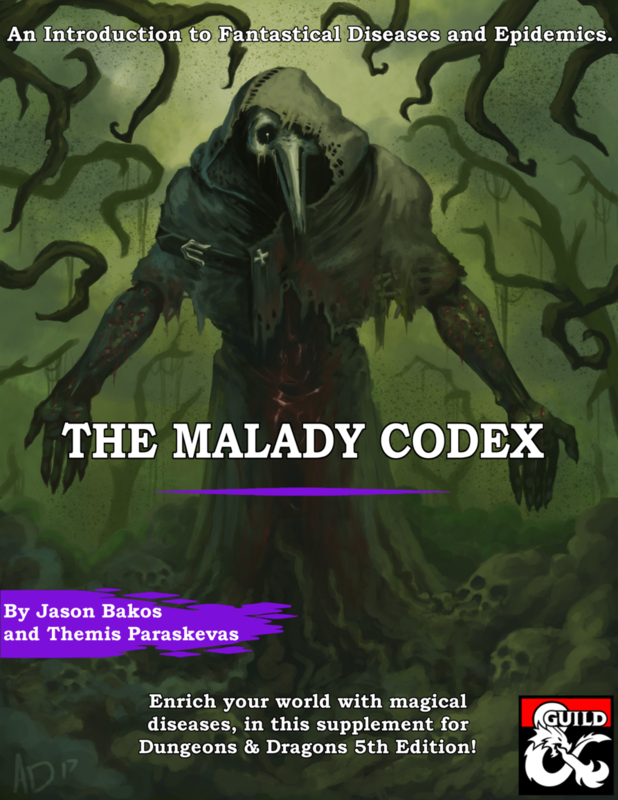 “The Malady Codex” features nearly a dozen diseases designed by medical students based on many real-world diseases, effectively applied to a fantasy universe. The diseases are organized by their origins as Magical, Divine, or Natural. Each disease is divided up into an easy-to-read series of notes, including the disease’s Cause, Symptoms, and Cures. Each disease is also given a potential plot hook for how to include it in a campaign. Some of these are well thought out, with original NPCs involved in the disease’s origins, such as the dragon Oxitorus the Choleric or the mold-spreading beholder Biathocax. Others are disappointingly vague and generic. I appreciated that almost all the diseases are based on real-world, well-known diseases, whether historical or modern, such as the Bubonic Plauge, Mad Cow Disease, Cholera, Leprosy, and even a whole category of interracial STDs. The real world links establish an easy touchstone for understanding these afflictions and how they could work within a D&D universe. Not all diseases are a pandemic. Many are actually non-lethal – but still a literal pain. The variety presented here helps provide an assortment of options depending upon how severe you want the disease to be – and whether or not that’s a focus of your storyline or merely a by-product. Necrophorum, for example, could be an easy excuse for a low-level party to help out a farmer, or a farming village dealing with diseased animals. 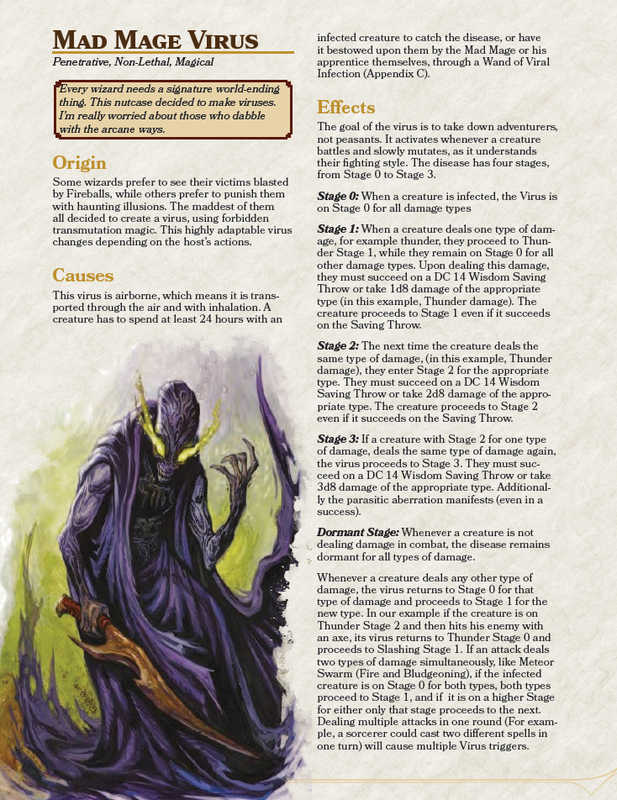 The Mindflayer Network and Demonic Virulence would be effective in campaigns that feature Mindflayers and Demons respectively (or both – hello Out of the Abyss! ), while the Mad Mage Virus could add an interesting twist to an encounter with enemy spellcasters. The appendices at the end offer a nice little bonus of disease-themed NPCs as well as a few statblocks and magical items. I wish this were a bigger section. The parasitic Medtroid-like Malady is very cool and thematic and I would loved to see more creatures, either disease-ridden or literal walking maladies themselves. 11 D&D-friendly diseases, organized by Origin, Symptoms, Cure, and potential Plot Hooks. Many of the diseases are based on real-world counterparts, such as Tetanus, Cholera, and Leprosy. Disease-healing abilities and spells are listed at the beginning. An appendix with several NPCs, statblocks and magical items with a disease theme. Mad Mage Virus is a neat idea but a bit overly complicated. Some of the plot hooks are just a few generic notes rather than specific stories. The Verdict: With nearly a dozen diseases inspired from real-world maladies, “The Malady Codex” provides a variety of interesting and terrible afflictions to add to your campaign.